It can be hard finding gifts that are out-of-the-box and just unique enough to be special. If you know which sites to visit, you can be presented with dozens and even hundreds of great gifts that not everyone in the world has. This means they won’t be expecting this gift, but they sure will be thankful for it. Like the name implies, Uncommon Goods is a site filled with gifts you won’t come across at your local department or big box stores. They have the gifts broken down by the type of recipient you’re buying for, so it’s easy to drill down and be presented with plenty of gifts that will be just right on Christmas Day. This scratch map lets you scratch off the places you’ve been, revealing a colorful display that really shows it off. You can make a game of it as you reach new destinations and try to uncover more of this wonderful world of ours. All you need is a coin to scratch off the outer coating. Go ahead, play with your food! This kit helps you look at foods in a totally different way. You can make regular food items turn into gourmet works of art using scientific principles like chemistry and physics. You don’t need a scientific background for this, as it will walk you through the steps on how to make dishes. This cute set has transformed an ordinary spoon, fork, and knife into construction vehicles that make mealtime fun. If you’ve been having trouble getting them to eat their food, this is a constructive way to get them to like the process more. The plate is designed so they can move food right onto the spoon using the bulldozer which is really the knife. Need a pick for your guitar? Punch them out and get playing. You can make a pick out of lots of different things, like used up credit cards or old membership badges. This gives the picks a custom appearance and is a way to recycle at the same time. Rock on! This is the perfect tray to serve up a delicious bowl of soup and a sandwich to go along with it. You can even get creative with it, as it serves as a cake and ice cream tray as well, or cereal and toast, or a fruit bowl and a muffin. The only limitation is your imagination. ThinkGeek is not just for geeks, but does have a lot of products that are geared toward the geek within us all. They cater to fans of things like Star Wars, Star Trek, The Big Bang Theory, Dr. Who, comic books, and Minecraft. Need we say more? This light is sure to be a favorite for fans of Tetris. It features interlocking Tetriminos that can be arranged and rearranged in many different patterns, and it only lights up when the pieces are put together. It’s made with bright LED bulbs so it can actually function as a lamp as well. This zombie Santa will appeal to zombie fans as a Christmas gift, and is the first time we’ve ever seen Santa made into a zombie. The good news is that he’s made of chocolate, so he serves a dual purpose: he’s both scary to look at, and delicious to eat. Ironic, you’ll actually be eating his brains. This portable gaming system can play your old SNES or NES cartridges directly. It can also be hooked up to your television so you can experience it on the big screen, while using an actual controller instead of your smartphone. Makes a great companion for long car trips and can even play Sega Genesis games. Dungeons & Dragons fans are going to love this bag, as it is a direct reference to a magical item found in that world. Like the game, this bag can hold what seems like more than it’s insides can carry. You’ll be astounded at what all fits in it, and its special design makes it so it all fits nicely without rattling around a lot. 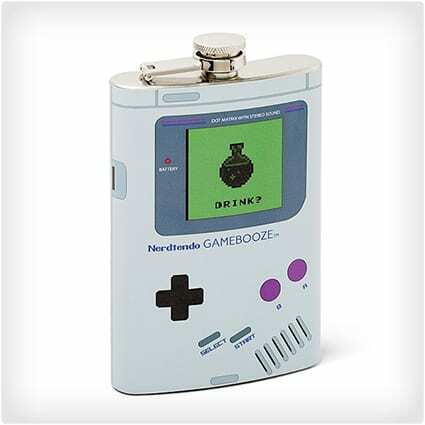 This flask resembles an old Nintendo Game Boy but is actually a flask for you to covertly take a sip of your favorite tasty beverage. The cap is attached to the flask so you don’t have to worry about dropping it or losing it. It is made from stainless steel, so you don’t have to be concerned with some of the harmful plastics out there. Red Envelope features distinctive gifts you won’t find at other stores. That means you can shop with confidence knowing that you’re getting them something that they’ll be happy with, and that not everyone has. It gives a gift that special quality of being unique one-of-a-kind, which is what we’re all after when we’re on the hunt for the perfect gift. These collar stays help your collar stay put, and they include personalized engraved messages on them that only you’ll be able to see when you’re putting them in. These can be customized to say whatever you want so you be very creative, or go with classic pick-me-ups to start the day right. The pub glasses can be customized with your name, the city you live, and a year, so they can mark a birth year, an anniversary, or the start of an important project. They’re fashioned after the sort of glasses you’d be served a pint in at the pub, but are meant for home use so you can avoid pub prices. If you ever need to remind them why you love them, these stones make it easy. Each one has a different reason etched onto it, which gives your love a certain feeling of permanence. The stones feel soft and smooth to the touch, so they’re great to put in the pocket for a consistent reminder throughout the day. This wine cellar sign resembles the sort of sign you’d see at a vineyard or large commercial wine cellar. It gets personalized with your family’s information, so it gives a room a very classy touch. You can hang it next to a wine rack to really define the space, and give it a theme. This growler features one of your initials, or both stacked one on top of the other. The growler itself is the distinctive Portland Growler, so it has the same look and design that they’re known for. You’re getting a high quality growler to store your beer, and it’s personalized so nobody will take the wrong one. You can shop with confidence at Hammacher Schlemmer because they’ve earned the reputation as having unique gifts that people are glad to receive. They’ve been around since 1848 so they know a thing or two about what people want. They used to be a catalog mostly but now they’ve got a full-on website for online ordering. Bring the fun of roasting marshmallows indoors with this flameless marshmallow roaster. This is actually a safer way to make marshmallows and s’mores because there is no flame and the marshmallows cook over a heater. It even includes roasting forks that you can use to hold the marshmallows, and a container for graham crackers and chocolate. If you’re serious about having the warmest hands possible this winter, these gloves are sure to get the job done. They are battery powered and have been confirmed to produce the most heat out of any other heated gloves on the market. If you’ve never tried heated gloves, they are much more effective than traditional gloves at keeping your hands warm. If you spend long hours in front of a computer on the keyboard and clicking the mouse, you are no stranger to the type of strain that comes by the end of the day. This reflexology hand massager makes it so all you have to do is insert your hand and let it go to work. It presses down on trigger points on your hands that should help relieve tension and ease the pain. This emergency radio is the one you’ll want to have on hand if you ever run into trouble. It has the ability to charge up using a hand crank, and you can even charge your mobile device. You’re able to pick up radio stations so you can hear the news during a crisis situation. You’re also able to pick up different weather bands so you can hear what is in store. This head pillow allows you to take a nap pretty much anywhere. It blocks out your eyes so that you have a dark and quiet atmosphere for sleeping. It even contains holes in the top to put your hands in to sleep on a desk with your hands propping your head. It muffles the surrounding sounds as well for a more quiet environment. Viva Terra is latin for Long live the Earth, and their products are all designed with sustainability in mind. This means that anything you buy is going to be eco-conscious, as well as something you won’t be seeing at the local Wal-Mart. You’ll find great gives here for anyone in your life that is trying to leave a smaller eco-footprint. It’s hard to find a decorative terrarium, because most times it either looks like a science project or is too big or too small. But this air plant terrarium is just right, and will look great on an office desk or anywhere in your living room. The best part is they require very little maintenance and come with just minimal assembly required. You can feel good about these dogs because they’re made from 100% percent recycled newspaper, and they want Tarab your place while you’re away at work. They even come with a set of optional antlers so you can doll them up for the holidays. These are quite possibly the easiest dogs to take care of. These owl mugs come from an artisan producer in Japan that makes them by hand, including the painting process. They’ll definitely brighten your morning and will give you something to look forward to when you start your day. Because they are handcrafted no two are exactly alike, so you will definitely have something special here. The olive plant as stood the test of time and is very resilient, being able to grow in a wide range of climates. This topiary really looks great anywhere in your home, and can bring life into nearly any space imaginable. The plant comes ready to enjoy, and shipping is included in the price. Here’s a colorful set of glasses that will give your table a Moroccan look. Each has a different design and color, making them truly unique. They have the option of adding tea lights to them for a decorative look. They’re great for serving tea in, but you can also serve any other beverage you like, including wine. Busted Tees has taken over the t-shirt market with original designs you won’t find anywhere else, and funny shirts that are sure to spark a conversation. They are always releasing new shirt ideas, so it’s great to check back every once in awhile to see what new offerings they have. They have great non-t-shirt products as well. These ski goggles have giant grizzly beard attached to them so you’ll look like a Yeti going down the slopes. It’s made of thermal fleece so it will help keep you warm, and is waterproof so it won’t become a big soppy mess while you’re skiing. It’s washable, because hey, beards do get messy, especially when they’re this size. Hello Kitty meets Grumpy Cat in this awesome t-shirt design. It’s all the elements you love about Hello Kitty, cuteness and a little bowtie, combined with the appeal of Grumpy Cat who’s just not having any of it. So whether you always wanted to see Hello Kitty grumpy, or Grumpy Cat made to look cute, this is it. This 8 Ball tells you how it is even if you don’t really want to hear it. Rather than the polite and to the point answers a Magic 8 Ball gives you, this rude crude version is like a slap in the face, no matter if the answer is yes, no, or unclear. Bring Facebook into the real world with these Like and Dislike stamps. You can give your seal of approval or disapproval on anything you’d like. Facebook doesn’t yet have a dislike button, and probably never will, but you can start disliking things now. These are good for up to 5000 stampings, and they ink themselves. Give your dog a mustache so that he can get in on the mustache craze currently underway. It’s basically a mustache on a ball, so when you dog fetches it they run back with a big old moustache on their snout. Fantastic photo opportunity, and your dog is none the wiser. Cloud 9 Living specializes and bringing lifelong dream experiences into reality. Whether you want to do laps like an Indy driver, or fly through the skies like a fighter pilot, they can help make it happen. Physical gifts will eventually wear out, get lost, break, or otherwise need replacing, but the memories from one of these experiences will last a lifetime. If you’ve ever wanted to feel what it’s like to drive a stock car around the racetrack, this is your chance. You’ll get behind the wheel of an actual racing car and be given the opportunity to put it through its paces. Everything is kept safe and supervised so you can really let ‘er rip. Take a cruise along the river for either dinner or lunch. You’ll be treated to an experience they’ll never forget as you slowly make your way past famous cities across the country. This is a great alternative to just another dinner in the city, and provides much more impressive views while you have a delicious meal. If the movie Top Gun got you feeling the need for speed, you won’t forget what it feels like to be a fighter pilot for a day. They’ll take you up and do spin flips and you’ll join in on a simulated combat routine. You actually get to pilot the plane while you’re up in the air so you can feel what it’s really like. Take a walk through some of the world’s best cities with a knowledgeable guide that will tell you things you wouldn’t have known otherwise. This is a great way to really delve into a city that you’ve been wanting to visit for quite some time. The guides are certified so you know you’ll be getting good information. If you’ve ever wanted to learn how to fly, and now is your chance. This learn to fly package includes instruction from experienced pilot that will tell you how to fly plane, even if you’ve never attempted to fly one before. You can choose between learning to fly a plane or a helicopter. Gift baskets are always well-received, and GiftTree has made it their business to be the best at putting them together. They not only think of interesting gift basket ideas, they execute the idea well, and assemble groups of products so you don’t have to try to do it yourself. They package them up nicely for a nice presentation. This basket pairs different products with Chicken Soup for the Soul books, so that the recipient can feel good on the inside as well as the outside. For example, you can get a basket that has Chicken Soup for the Tea Lover’s Soul packaged with a bunch of different tea items. Totally thoughtful with no thinking required on your part. This cheese slate looks very rustic and can be engraved with three letters to give it some personalization making it special. It also comes with the first batch of cheeses, meat, and mustard so they’ll have something to put on it as soon as they get it. How about an asiago wedge or a black pepper wedge with crackers? This terrarium is made from an old wine bottle that’s been upcycled into a new environment for plants. The kit comes with everything they’ll need in order to start growing a plant, including the seeds, pebbles, and what’s known as growing medium, so no soil is needed. Here’s a chest full of wines selected from countries around the world. It lets you feel like you’re taking a world tour without having to leave the comfort of home. There’s also an assortment of foods from different countries that pair well with the wines, which makes this a great package for entertaining. This festive nutcracker is shaped like a reindeer and quality made out of solid metal. It comes in a decorative box for safekeeping so you’ll always know where it is. The tail is actually the lever that you press down in order to crack the nut, and there’s even an option to have it engraved. Don’t know what they like? No worries, The Grand Gourmet gift basket has a little bit of everything, and it’s all high quality goodies. From smoked salmon to chocolate truffles, they’ll be overwhelmed by an onslaught of edible deliciousness, and will surely thank you the next time they see you. The Sharper Image is famous for their cutting edge gifts, many of which attempt to solve 21st century first world problems. They do a good job of pre-screening products to make sure they work as described, so you can trust that what you’re getting is not a prototype but a real working product. If your tie collection is getting to the point where you can’t make heads or tails of what you own any more, this motorized tie rack will parade your ties past you with the touch of a button. This has been a bestseller of theirs for years, and has recently been given a new and updated look. You don’t need a camera and a computer anymore to print off great shots. All that’s required is connecting your smartphone to this photo printer and you’ve got your own photo print shop set up. It prints full color borderless photos just like you get from places like CVS or Wal-Mart. You can get pretty thirsty while playing 18 holes, and this club have you covered because it’s actually not a club at all but rather a drink dispenser. This isn’t a cheesy looking replica, it’s using a real shaft and a real club head so it will look just like the other clubs in your bag, except that it has a different purpose. Get the benefit of using essential oils without having to worry about burning them with a candle. This diffuser turns essential oils into a fine mist when you combine them with water. This allows you to breath them in, or appreciate their aroma without worrying about an open flame. Finally put a stop to nighttime noise making with this anti-snore pillow. It is specially designed to put your head in a particular position so that you do not block your airway causing that distinctive snoring sound that keeps your partner awake. It’s been FDA cleared and is filled with memory foam so your head will be supported in a customized way. SkyMall is famous for being that catalogue you see while you’re waiting for your plane to take off. But they have branched out into the online world and now you don’t need to be on a flight in order to check out the awesome gifts they have. Giving the gift of money is always appreciated, but it can be a bit lazy for them to just open it and have it. This turns it into a game, and they’ll have to unlock the money by completing the maze before they can have it. You can also put a gift card or candy on the inside, so get creative! This is just like the old fashioned View-Master that you remember as a kid, but now you can see 3D pictures that you choose because it’s fully customized with your own photos. It’s a great way to capture a family trip, or make a slideshow of special times together so they’ll never forget it. This is a gift that keeps on giving, at least for a week. With each candle you buy you feed a child for a week. The candle itself is a ceramic mug that has a child’s handprint formed right into it. It’s a humble reminder to be thankful for what you have, and at the same time it improves a life. Check in to see if you’re looking classy with this mustache mirror. It features three unique moustaches so you can move from side to side to see which one goes best with your current attire. It’s also fun to use with a friend or two, as you can each pose with a different stache. You send in the pic and they’ll make pop art with it. You can choose a person or a pet and they’ll work their pop art magic and turn it into something Andy Warhol would have been proud of. It will come in a similar format to what you see here, with the same picture repeated four times in different color schemes. Animi Causa is all about capturing modern design and bringing it to you in various products like furniture and accessories. You won’t see these kinds of products anywhere else, so you know you’ll be getting items that are unique, and a bit unusual. It’s easy to lose yourself in this site with all of the amazing gifts they have available. These bookmarks look like zippers that have been sewn right into the book. It almost suggests that you’re zipping open a book and stepping inside it when you read, which is a pretty fair analogy. They come in three different colors, so you’ll have plenty of bookmarks for the different books you’re reading. This looks like a pencil sharpener, but is actually a new way to peel and sharpen your vegetables. Insert a carrot and you’ll see how it works to first peel and then slice it down until the carrot becomes sharp like a pencil. It’s a fast and easy way to curl up vegetables for use in a decorative salad. This gadget allows you to make perfect slices of cake so you don’t have to worry if someone is getting a piece that’s too big or too small. It will automatically cut your cake up into as many slices as you want, from 6 to 14 slices so you can easily divvy it up for a small or larger gathering. This wine bottle holder makes it appear like it’s been lassoed and is hovering in midair. It’s actually made out of rope, and it’s designed in a way so that the weight of the bottle is balanced by the way the rope extends out and back and forth. It gives the appearance that the bottle is suspended in the middle of being roped. Maybe if your office mates keep stealing your supplies they’ll be less likely to if they think it’s just a can of sardines. Inside it’s full of fish-shaped paper clips that work just like the real thing. They give your paperwork a new look and will help you keep everything organized. If you are struggling to come up with unique 2018 Christmas gifts for mom and are sick of giving her the same boring gifts year after year, let us help you with our list of 100+ must-have mom gifts that won’t leave her feeling underwhelmed this holiday. If you’re looking for a large selection of creative and authentic gifts that will surprise and make grandpa smile, you’ve come to the right place. When you’re looking for a Christmas gift that’s ‘just so’ for your girlfriend, peruse this list to find something for every type of lady, whatever her tastes and whatever your budget. From store chic to DIY geek, it’s all here. Finding a truly unique 2018 Christmas gift can be a challenge. Sometimes, it is not just about what’s hot and new, but what also is classic and nostalgic. This holiday, give him a gift that inspires, excites, touches his tender heart and proves once and for all that Good Gifts Do Exist.